Dreamland is eminently known for barbecue ribs. The original Dreamland Cafe is located about two miles from the intersection of Hwy 82 and Interstate 59 just south of Tuscaloosa in an area known as Jerusalem Heights. In the years since Mr. John "Big Daddy" Bishop first opened his store, little has changed. The roads have been paved much the same as they were back in 1958. The décor inside is warm and dark. The dining room is small with a big bar, a few tables, booths and a pot bellied stove. Beer signs hang from the oak beams and Christmas lights hang from the walls year-round. It isn't fancy, but then again the ribs are the main attraction anyway. The atmosphere is casual down-home. You may rub elbows with somebody famous while you sit at the bar; and people come from all over to enjoy the ribs. The point is that it doesn't matter who you are. At Dreamland everybody is special and everybody is there for the same reason – the ribs. The ribs, service and atmosphere are also available in our other locations. In addition to the legendary ribs and sauce, the menu has been expanded to include such items as baked beans, potato salad, coleslaw, banana pudding, salads, pork sandwiches and barbecue chicken. University of Alabama paraphernalia lines the walls of the original Dreamland building where hickory-smoked pork spareribs have been grilled to perfection for more than 50 years. The sauce recipe is a tightly kept secret, but what we do know is that it's a vinegar-based sauce with hints of garlic and brown sugar. 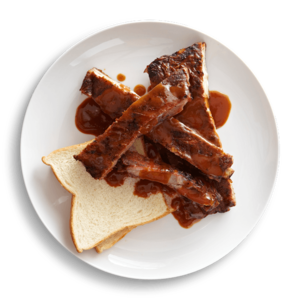 Dreamland encourages its customers to use the slices of white bread served with the ribs to soak up any extra sauce left on their plates. Celebrities like Reba McEntire and Hank Williams Jr. have been known to stop by the restaurant to sample the legendary ribs and sauce. And once you’ve visited the original, it’s likely you’ll want more. Luckily, ribs can be ordered and shipped right to your front door, fully cooked, vacuum-sealed and packed on dry ice. Rib packages include Dreamland's famous sauce and a loaf of Sunbeam bread.